Al-Shami and his friends numbered 15 and the mosque was filled with worshippers. Al-Shami and his friends felt anxious: what if nobody joined in with them? Fridays in certain Damascene neighborhoods did not differ greatly from those in the rest of the country. Following the Friday noon sermon, demonstrations and protests would emerge from various mosques taking advantage of the allowed gathering of a large number of people and calling for the overthrow of the Asad regime. Fridays remained like this for the first two years of the uprising. In al-Shaghur, a neighborhood southeast of Old Damascus, demonstrators would gather at the centrally located al-Bashura mosque. On June 1, 2012, as the armed opposition forces launched an offensive to take Damascus, al-Shaghur-based activist "Wa'el al-Shami" and his friends decided to launch an anti-regime protest from the mosque. Al-Shami and his friends numbered 15 and the mosque was filled with worshippers. They felt anxious: what if nobody joined in with them? As the number of participants grew, the chanting changed for the fall of the regime, “People of Damascus, Here in al-Shaghur, the Regime Has Already Collapsed” and “Syria, Syria, Freedom.” They marched 50 meters south of the mosque to Musallabah square and back to the mosque, with nobody regulating the movement of the protest. People gathered in the street between the mosque and the square, moving with the protest in either direction for 15 minutes. In this time, a group of security forces had gathered at the mosque, waiting for the protestors to head back to the square to launch at attack then. 25-year-old al-Shami was at the rear of the protest, taking pictures and documenting the event. A security agent tried to grab his shoulder, so that al-Shami ran away as quickly as possible. Al-Shami was wearing plastic slippers that had come off while he was running. He ran until he reached the Malja' incline, opposite to the Musallabah square and next to “Inner Shaghur”, which is inside the walled Old City. Though he ran, al-Shami held on to his camera and had managed to shoot footage of the protest, which can be viewed in the video below. [A video purports to show a protest near al-Bashura mosque in al-Shaghur neighborhood (south-eastern Old Damascus), the moment it was attacked by pro-regime mobsters (shabiha) - 1-6-2012 (Shaghur Coordination Committee)]. In Inner Shaghur, a man noticed the barefoot al-Shami and deduced that he had been at a protest. The man was kind enough to give the activist another pair of slippers, though in poor condition, which he used to return home. Once home, al-Shami recounted his day to his family who joked with him that the mukhabarat (security forces) had taken his slippers and were going from house to house in the neighborhood to find out who they belonged to. Though a joke, it was not necessarily an exaggeration; the mukhabarat are known to go at any lengths to capture protesters. Al-Shami to this day lives in Damascus, where he documents significant events, deaths, and the transfer of detainees, in addition to organizing protests. 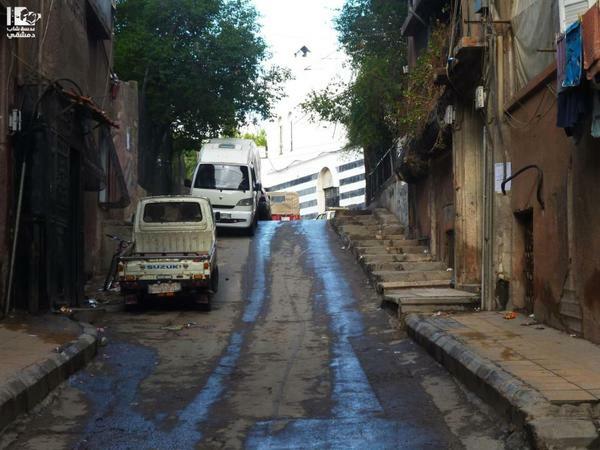 [Photo: Malja' Incline - Inner Shaghur - Damascus (Lens Young Dimashqi's Facebook page)]. [1st Image: An artwork by Jaber al-ʿAzmah (Dawlati website)].